If you're not holding a dragon, here, hold two! This type of card is usually hot garbage. I think this particular one, because the tribe is so limited and because of how the tribe works, might actually be playable. It's still terrible. Just not as terrible as the other iterations of it. Better to discover it from the 2 drop dragon thingy than actually play it, though. The most important thing about this card is that we will start seeing Nozdormu in ranked matches. you are getting 1 less choice but 2 cards, also holding dragons is the dragon thing.. I can see this card seeing play actually, it's quite good at generating value and making sure you are holding a dragon, and most dragons are pretty good. 2 mana 1/3 discover a dragon was played because it pulled Drakonid Operative 4 times more than any other dragon due to class-weighting for discover mechanics. This *may* see play, but these days the pool of dragons is weaker than they hey-day of Dragon Priest. At least it's good for a starter dragon warrior deck, for those players that don't have all the big legendaries. Dragons are better than deathrattle minions. I think this will definitely see play. 2 mana is very little for the value it can generates. I am going to guess that if Dragon Warrior is a deck, it plays at least 1 copy of this. Probably 2. 3) This is 2(4) dragons for 1(2) card/s. 4) The cards from this card can/will synergize with themselves. 5) Bonus RNG top end for your deck. This will absolutely see play if dragon warrior is competitive. None of the dragons are bad except temporus. There are some below average ones but they are one of the best tribes to pull two of. Even if you draw one good, one bad, it's a good card. Play the good one, and leave the below average one in hand to trigger all your dragon effects. Warriors play pretty passive in general, so this will be an easy play on turns where there is nothing urgent to do. First of all, 2 mana for 2 cards is great value. You very rarely get that. Usually it's 3 mana for 2 cards. Second, holding a Dragon is very good so this has value just for an activator. Third, Dragons tend to be far better than average. There are very few garbage Dragons and several of them are in fact very good. Dude...I'm in on this card. I don't know what you're getting at. But this type if card is usually hot garbage because 2 random cards is usually hot garbage. We've seen it before. This card isn't for the reasons I stated in my other posts. This is actually pretty good! Back whe dragon warrior was good it sometimes ran into the problem of how many dragons to play. Towing the line where they'd always have enough dragons to reliably get their activations off but even then there were times you weren't able to get the activation of holding a dragon or would be forced to slow down and hold a dragon to save for a bigger effect. 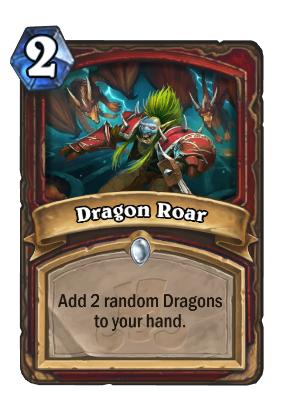 This will allow you to add less dragons to your dragon deck (ironic I know) and the fact it gives two is crucial. That way you can still have a dragon to play and one to hold. Will still depend on whether the dragons in rotation are good enough though. Maybe next expansion if not. With such a name it should of dealt damage or an effect of some kind. Sometimes I think Blizzards trolls us. Getting Emeriss in a rush-dragon deck in a class like warrior that actually has some longevity is actually crazy. I think the dragon pool right now is really, really solid. Sindragosa generates value. The worst dragons I can think of are Marsh Drake and MAYBE Carrion Drake. Marsh Drake can be played around with weapons potentially and carrion drake isn't that bad. A value card that can help tempo by providing dragon activators.